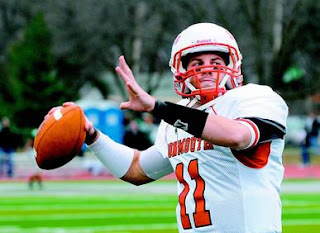 The Chiefs’ 90 man roster is complete, as Kansas City signed former Monmouth College quarterback Alex Tanney. The 6’4, 220 lb. Tanney is the final player the Chiefs signed, after he impressed the coaching staff during Kansas City’s organized team activity workouts. Tanney is best known for his foray of trick throws and arm strength, which he displayed in a YouTube video that became extremely popular before the 2012 NFL draft. Despite his talent, Tanney was not highly regarded by most pro teams, and appears to be a long shot to ever see the field. The rookie did put up big numbers in college, setting NCAA Division III records in career passing yards and touchdowns. While it remains to be seen if Tanney has what it takes to make an NFL roster, Kansas City fans can at least try to coax some more highlight-worthy throws out of the YouTube sensation. Chiefs Alex Tanney Trick QB Youtube Video Kansas City News, official kc news site with breaking stories on The Kansas City Royals, Chiefs, charity events, the 2012 MLB All Star Game, weather, sports, MU, KU, ufo sightings, dui checkpoints, Kansas City neighborhoods, nightlife, concerts, the Sprint Center, the Power and Light District and current Kansas City news articles. Wow, those are some incredible trick shots. Welcome Alex Tanney to our Kansas City Chiefs and hope you make the team, if for nothing else, just to make more trick shot videos! You can tell that some of those trick qb shots by Alex Tanney took a long time to get because of the way the crowd around reacts, but still, pretty cool stuff Alex. Looking forward to seeing Tanney on the field at 1 Arrowhead Drive.